4.) Have ride merchandise hidden and ready to be purchased, just moments after the official announcement is made. 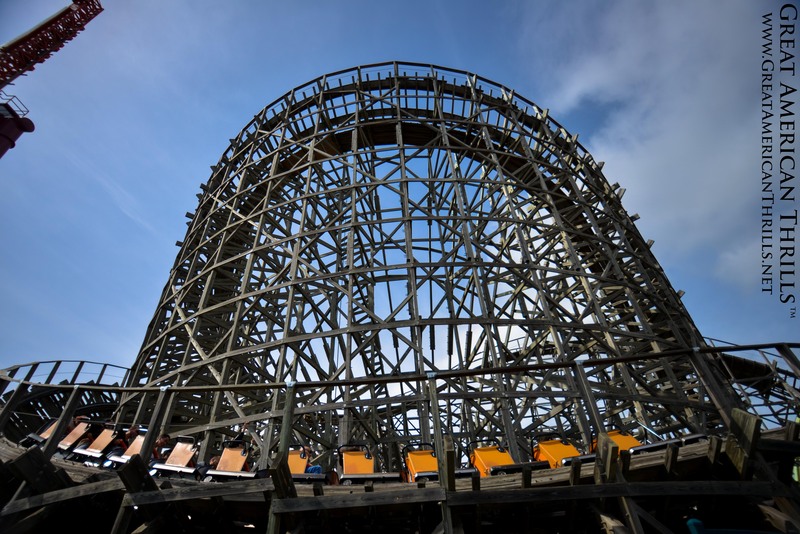 Kings Island in Ohio hit all of those on Thursday evening, even with major online streaming issues, when they officially announced Mystic Timbers – their record-setting 5th wooden coaster. You see, the POV wasn’t complete – there’s a little section at the end that they purposely omitted – only to show yet another hashtag: #WhatsInTheShed. And that, ladies and gentlemen, is how you keep the coaster enthusiasts satisfied, curious and talking up a ride that isn’t even built for another 10 months on this project. We’ll all find out what’s in that shed come the 2017 season. But for now, this is truly one of the best times of the year for park fans! Are YOU excited for the 2017 season? What’s your most anticipated coaster or park announcement? When it opened in 1998, Roar! was the first modern wooden coaster to feature “Millennium Flyer” trains. Using patents and designs from the 1920’s, Great Coasters, International were able to make this version of Roar! with tighter curves and sharper transitions, simply because the trains’ were able to negotiate them better. All GCI installations since now feature these “throwback” trains. Sadly, this coaster has deteriorated rapidly in the past few years – and is so rough, that I’d have to recommend a PASS on riding it – which is hard to do, considering it’s amazing layout and speed.